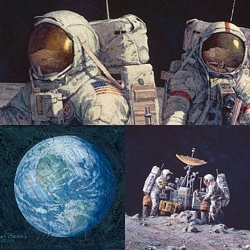 Image Size: 17 1/2"w x 23 1/4"h.
Alan Bean's "First Men: Edwin E. 'Buzz' Aldrin," the companion work to "First Men: Neil A. Armstrong," is now available. Armstrong's iconic photo of Aldrin is arguably the most recognized picture ever taken, but beyond some grainy television images and a great shot of his foot, there are no really good photographs of Neil Armstrong on the Moon. Bean conceived this set, "First Men," to remedy that. He chose the moment on July 20, 1969 when Armstrong took Aldrin's picture as the setting. Aficionados have long recognized that Neil can actually be seen as a reflection in Buzz's helmet. A series of calculations from that enabled Bean to replicate Armstrong's positioning exactly when he created "First Men: Neil A. Armstrong." Bean's "First Men: Edwin E. 'Buzz' Aldrin" is so much more than a photograph. The tools Alan Bean used to explore the Moon now help him to put the Moon's stamp on each painting he creates. Exact replicas of his Moon boots are used to make footprints across the painting's surface, reminiscent of the Apollo boot prints remaining on the Moon today. Streaks etched on the painting's surface are from the same geology hammer he used on the Apollo 12 mission. Finally, a sharp edged bit from one of the core tubes is used to make the circular indentations in the surface. All are captured in stunning detail in each edition. If you already have the first canvas or paper edition of "First Men: Neil Armstrong," you can now complete your set with "First Men: Edwin E. 'Buzz' Aldrin." Remember, there were only 75 Armstrong canvases and the same number of 75 Aldrin canvases has been created. If you can't make a matching pair of the canvases, you can still do so with the Giclee paper editions. Most importantly, each edition is a historic document signed by the artist Apollo 12 astronaut Captain Alan Bean. They are a wonderful set and a unique record of that exciting time in history. "I guess every astronaut wanted to be the first man on the Moon. I know I did. And if we couldn't be the first, we at least wanted to be one of the first. Apollo 11's crew got the opportunity to make the first attempt. Neil, Buzz and Mike flew a perfect flight and went into the history books; but all 400,000 Americans that helped make Apollo a success are in that history, too."